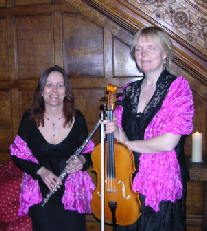 Devon and Cornwall based, Pink Champagne String Quartet is one of the most outstanding string quartets specialising in playing music for civil wedding ceremonies, church services, civil partnerships, entertainments, concerts, corporate functions, fundraising and other events - perfect music for your wedding or special occasion! Mozart wrote beautiful music for Flute Quartet and Bach also wrote his famous Badinerie for flute and strings. The Dance of the Blessed Spirits by Gluck is a popular choice during the signing of the register at wedding ceremonies. We are happy to help you choose the right music for your event, just click on our music list for more suggestions. We have lots of music that’s not on the list, so it’s always worth asking if you have a favourite. The violin family of instruments mainly developed in their present form from the 17th century onwards. Most people will be familiar with the violin and the cello (short for violoncello), which usually play the upper and lower parts respectively, but between these is the viola, which looks like a large violin, but produces a lower pitch with deeper tone. A standard String Quartet consists of 2 violins, a viola and a cello. 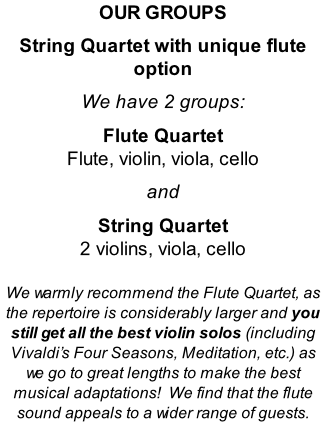 The combination of flute, violin, viola and cello is called a Flute Quartet. The flute is descended from some of the earliest prehistoric musical instruments made of bones or mammoth tusks, though these days most flute-players (known as flautists) favour silver, gold or even platinum! The modern flute developed in the 17th and 18th centuries, and in order to play it the flautist holds the flute horizontally and blows across a hole at the head of the instrument. Different notes are made by pressing keys in different combinations. The flute produces a beautiful velvety sound, perfectly complementing the violin, viola and cello. To find out more about Pink Champagne for your wedding or civil partnership, click here. To find out more about Pink Champagne for other celebrations or events, click here.